[124 Pages Report] The smart beacon market is expected to reach USD 19,805.5 Million by 2023 from USD 770.3 Million in 2016, at a CAGR of 56.2% between 2017 and 2023. The base year considered for the study is 2016, and the forecast period is between 2017 and 2023. The objective of the report is to provide a detailed analysis of the market based on beacon standard, connectivity type, offering, end use, and geography. The report also provides information regarding the major factors influencing the growth of the smart beacon market (drivers, restraints, opportunities, and industry-specific challenges), along with the detailed value chain. In addition, the key players in the smart beacon market have been strategically profiled, and their market ranking and core competencies have been comprehensively analyzed, along with detailing the competitive landscape for the market players, and the strategies such as product launches and developments, acquisitions, partnerships, contracts, and expansion adopted by them to grow in the market. This research study involves an extensive use of secondary sources, directories, and databases (such as annual reports, press releases, journals, Unacast (Proxbook), Institute of Electrical and Electronics Engineers (IEEE), company websites, and other paid databases) to identify and collect information useful for this study. The entire procedure includes the study of the financial reports of top market players. After arriving at the overall market size, the total market has been split into several segments and subsegments, and this data has been confirmed with the key industry experts, such as CEOs, VPs, directors, and marketing executives. The figure below shows the breakdown of primaries based on company type, designation, and region conducted during the research study. Estimote (US), Aruba (A Hewlett Packard Enterprise Company) (US), Kontakt.io (Poland), Cisco (US) , Bluvision (An HID Global Company) (US), Onyx Beacon (Romania), Leantegra (US), Gimbal (US), Accent Systems (Spain), Swirl Networks (US), Sensoro (US), JAALEE Technology (China), Beaconinside (Germany), Blesh (US), and BlueUp (Italy) are some of the major players in the smart beacon market. The smart beacon market is expected to be valued at USD 1,363.6 million in 2017 and is likely to reach USD 19,805.5 million by 2023, at a CAGR of 56.2% between 2017 and 2023. The growing adoption of smartphones and the increasing focus on business intelligence to gain competitive advantage are driving the growth of the market. Further, smart beacons are increasingly being used to generate spatial data to be used in analytics, which is also contributing to the growth of the smart beacon market. The demand for smart beacons across various applications in the logistics and transportation end users is expected to grow at a high rate over the next 6 years. The retail end users accounted for the largest share of the market in 2016. The growth of the market for logistics and transportation can be attributed to the capability of beacons to provide real-time asset tracking to determine the exact time of the delivery of goods to the customers, at lower costs. The market for Eddystone is expected to grow at the highest CAGR between 2017 and 2023. This can be attributed to the added features provided by Eddystone over iBeacon standard. Further, Eddystone standard is generally used in the retail industry for proximity marketing. Europe held the largest share of the smart beacon market in 2016 owing to the high traction of the beacon technology and growing need for technologically advanced marketing platforms among the end users to capture the shares in the respective markets. In addition, Europe is an early adopter of the technology, and the customers in this region have accepted the technology seamlessly. APAC is expected to witness significant growth due to the growing traction of the beacon technology in China and Australia. Further, the market is still in a nascent stage in this region and has a lot of potential. The growing trend among offline stores to opt for online platforms in the retail sector is anticipated to restrict the market growth in the latter phase of the forecast period. Further, the restricted sensing capabilities due to limitations in underlying BLE technology, and growing security and privacy concerns are expected to pose challenges to the market growth. 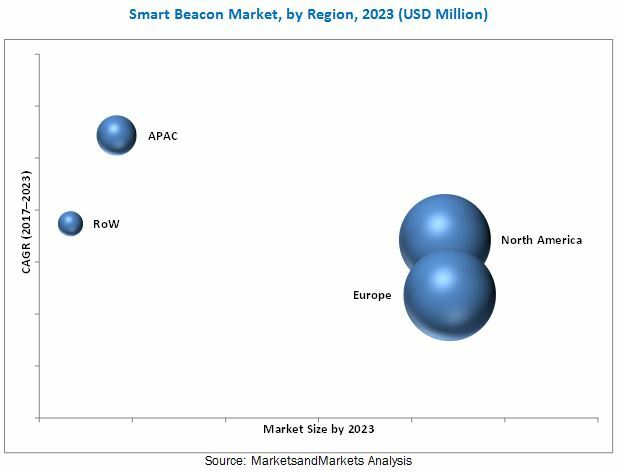 Some of the key players in the smart beacon market are Estimote (US), Aruba (A Hewlett Packard Enterprise Company) (US), Kontakt.io (Poland), Cisco (US), Bluvision (An HID Global Company) (US), Onyx Beacon (Romania), Leantegra (US), Gimbal (US), Accent Systems (Spain), Swirl Networks (US), Sensoro (US), JAALEE Technology (China), Beaconinside (Germany), Blesh (US), and BlueUp (Italy). These players adopted various strategies, such as product launches and developments, acquisitions, partnerships, expansions, funding, and contracts, to grow in the market.